Jackfruit is absolutely one of a kind tropical fruit recognized for its unique shape, and size. The fruity flavor of its sweet arils (bulbs) can be appreciated from a distance. In common with other tropical fruits such as durian, banana, etc., it is also rich in energy, dietary fiber, minerals, and vitamins and free from saturated fats or cholesterol; fitting it into one of the healthy treats to relish! Botanically, this popular Asian tropical fruit belongs to the family of Moraceae, of the genus: Artocarpus and is closely related to figs, mulberry, and breadfruit. Scientific name: Artocarpus heterophyllus. Jackfruit tree with a heavy yield. Huge jackfruit tree. Jackfruit is a huge tree that grows to as high as 30 meters, larger than mango, breadfruit, etc. It is believed to be indigenous to the Southwestern rain forests of India. Today, it widely cultivated in the tropical regions of the Indian subcontinent, Thailand, Malaysia, Indonesia and Brazil for its fruit, seeds, and wood. The tree grows best in tropical humid and rainy climates but rarely survives cold and frosty conditions. Jackfruit (Artocarpus heterophyllus). Golden-yellow color edible aril (bulb). In a season, each tree bears as many as 250 large fruits, supposed to be the biggest tree-borne fruits in the world. 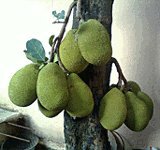 The fruit varies widely in size, weigh from 3 to 30 kg, and has oblong or round shape, measuring 10 cm to 60 cm in length, 25 to 75 cm in diameter. While unripe fruits are green, they turn light brown and spread a strong sweet, fruity smell once ripe. As in the durian fruit, the outer surface of the jackfruit is also covered by blunt spikes which become soft as the fruit ripen. Its interior consists of eye-catching orange-yellow color edible bulbs. Each bulb consists of sweet flesh (sheath) that encloses a smooth, oval, light-brown seed. There may be as many as 50 to 500 edible bulbs embedded in a single fruit interspersed in-between thin bands of fibers. Jackfruit seed encased inside a thin, transparent outer cover. It largely composes of starch and protein. Each seed measures about 2 to 4 cm in length, and 1 to 3 cm in thickness. Almost all the parts of the tree secrete white sticky latex-like milk (juice) upon infliction of injury. 100 g of edible jackfruit bulbs provide 95 calories. The fruit made of soft, easily digestible flesh (arils) made up of simple sugars like fructose and sucrose that when eaten replenishes energy and revitalizes the body instantly. Jackfruit is rich in dietary fiber, which makes it a good bulk laxative. The fiber content helps protect the colon mucosa by binding to and eliminating cancer-causing chemicals from the colon. The fresh fruit has small but significant amounts of vitamin-A, and flavonoid pigments such as carotene-ß, xanthin, lutein, and cryptoxanthin-ß. Together, these compounds play vital roles in antioxidant and vision functions. Vitamin-A also required for maintaining the integrity of mucosa and skin. Consumption of natural fruits rich in vitamin-A and carotenes has been found to protect from lung and oral cavity cancers. Jackfruit is a good source of antioxidant vitamin-C, provides about 13.7 mg or 23% of RDA. Consumption of foods rich in vitamin-C helps the body develop resistance against infectious agents and scavenge harmful free radicals. Further, fresh fruit is a good source of potassium, magnesium, manganese, and iron. Potassium is an important component of cell and body fluids that helps controlling heart rate and blood pressure. Jackfruit seeds are indeed very rich in digestible starch, protein, and minerals. In general, the seeds are gathered from the ripe fruit during summer, sun-dried and stored for use during the rainy season in many parts of South-Indian states. Again, in these areas, jackfruit seeds can be employed in a variety of recipes where they are eaten either by roasting as a snack or added to stews (curries) in place of lentils. Jackfruit is a summer season fruit coinciding with other tropical favorites like mango, durian, and mangosteen. In the stores, buy fruit that emits mild yet rich flavor and just yields to thumb pressure. Thorn-like projections become softer in the case of the ripe fruit. Once ripen, the fruit deteriorates rather quickly unless its processed arils (bulbs) stored in the refrigerator. Jackfruit - inside with edible arils. Cut the fruit in a similar fashion like other large size fruits like breadfruit. White, gummy latex oozes from the cut ends even in ripe fruits but to a lesser extent than in green unripe one. This latex problem can be overcome by applying a little coconut oil on the hands while separating bulbs since protective gloves would not help. Another great way of dealing with latex problem is mopping or rubbing the cut sections with a lemon slice or gently drowning in a bowl of acidulated water. Discard the thick rind that runs through the middle of the fruit, and the whole section is gently twisted few times to loosen individual arils (bulbs). Each aril (bulb) is made of sweet, thick orange-yellow flesh; cut it open with a small knife or split the bulb with fingertips vertically. Inside each bulb, you find a thick light brown color seed; keep it aside and enjoy the delicious flesh (sheath). Jackfruit bulbs have a unique flavor and sweet taste. Enjoy them without any additions to experience their rich taste. Jackfruit slices hand-mixed with grated coconut, honey, banana slices is one of the wonderfully delicious dessert preparations commonly served on festive occasions in southern parts of India. The fruit also used in jam, jelly and chutney preparations. Fruit slices are a great addition to fruit salad. Jackfruit seeds are a good source of protein and minerals; used like vegetables and pulses in curry (sabzi) preparation in several Asian countries. Unripe green fruit employed like a vegetable in the preparation known as "kathal ki sabzi" in some North Indian states and "sayur nangka" in Indonesia. <<-Read Breadfruit nutrition facts and health benefits. <<-Back to Fruits from Jackfruit. Visit here for an impressive list of all variety of fruits with complete illustrations of their nutrition facts and health benefits.